Right now we are in LIVE MODE for a severe weather event. Take a moment and join us for free and get access to member only features like LIVE MODE. Re the surge...PCB and, if I'm remembering correctly, Mexico Beach are kind of different in places, as in the residential areas are at a higher elevation than the actual gulf beach area. Could the topo account for why the surge damage is not the same as with Katrina (MS coastal communities are at the same elevation as the gulf beach areas) and with Ivan (Perdido Key & P'cola areas are similar to the MS coastal areas.) Does that make sense??? First Category 3 hurricane to move through Georgia since 1898. Someone tell me if I am wrong, but I guess PCB would have been spared from the worst of the surge because the wind would have been blowing more in an offshore direction? I think the speed will figure into the whole situation however, not all places hit are able to be surveyed right now due to roads being blocked by debris. Drone footage of serious damage in Panama City. The first part of the video shows a high school gymnasium with a hole ripped straight through it. 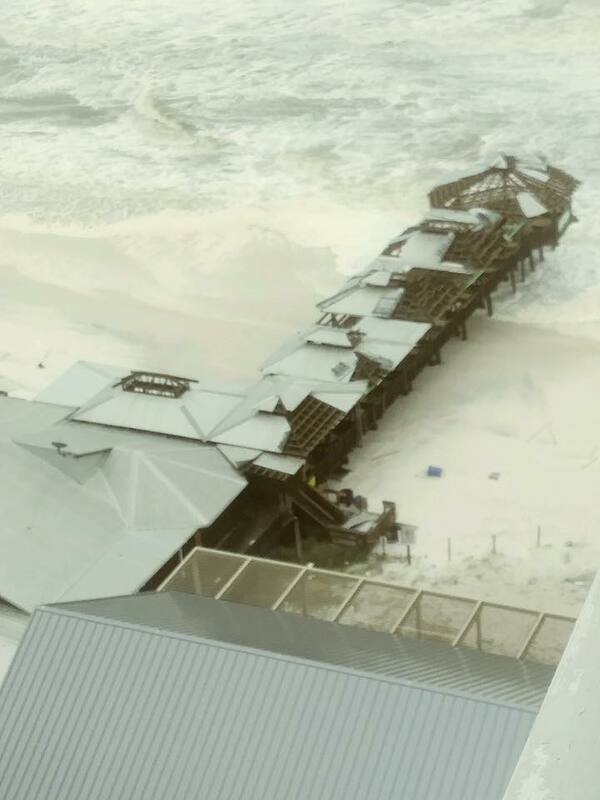 Has anyone heard how popular tourist spots at Panama City Beach fared, such as Pineapple Willy’s, Spinnaker’s, Schooner’s, Pier Park and Club La Vela? I would guess that gym wall wasn't reinforced. Heard a report that the gym wall was "compromised" for some time, no other details but yeah, it doesn't seem like it was that stable to begin with. I noticed that the big 3 networks interrupted regular programming to cover the eye of Hurricane Michael coming ashore. I don’t recall NBC, CBS and ABC interrupting programming to cover landfalling major hurricanes. Is this practice fairly recent? Yeah, I'm not trying to be all "anchor bolts" here but it did look like a pretty flimsy wall. Obviously lots of other damage that shows how powerful the winds were. A bit late, but bad news from Florida. Apparently a Greensboro man was killed in his home this evening when a tree fell on top of it. Sounds like the wind damage in Panama City, PCB, Callaway, Parker, Springfield, etc and surrounding areas and inland toward Marianna is severe and in some parts absolutely catastrophic. Sounds like preliminary surge reports show it didn't reach projected heights but the wind certainly did. Going to be a grueling next few months (if not more) in many of these areas. My cousin is located between Callaway and Springfield. They have a good bit of damage to their house. Tree down on it. Roof gone in places. 1 mile away there's an older shopping center/strip mall that was completely leveled. Found the pictures on social media. Tomorrow is going to reveal truly breathtaking damage. Going to be really tough times for awhile down there. I can't imagine what Michael would've done if he had been a much larger storm of that same intensity. I don't even want to know. No doubt that he's going to change the future history and development of large swaths of Bay County. Very tragic. I hope those of you on the board with family down there find that all are safe and well. And for those with property there, or that live there, you'll be in my prayers. A truly unbelievable storm. From nothing to Cat 5* in just a few days. I'd like to hope it is the last, but we all know that tomorrow is likely to bring reports of more deaths. WMBB, the ABC affiliate in Panama City, Florida, is off the air. As a result, it's sister stations are filling in for them, including WIAT in Birmingham. Anyone heard from Jack? I once had his phone number but I lost it with a bunch of others a while back. Shopping center exactly one mile from my cousin's house. They stayed and rode the storm out. Jack and Bette are fine. They evacuated to Enterprise. Jack posted on FB earlier saying that he heard from his HOA and not much damage to his building so that is good news.